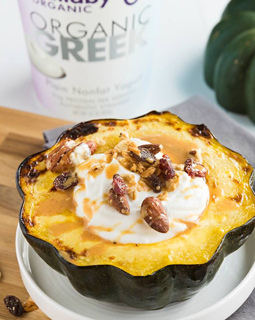 Acorn Squash Breakfast Bowl - A recipe from Savor California, the online showcase for extraordinary gourmet foods and beverages from California. Put the squash, cut side down, on a foil-lined baking sheet. Roast for a total of 20 - 30 minutes, turning the squash over halfway through. Fill with Wallaby yogurt. Top with nuts and drizzle with honey.